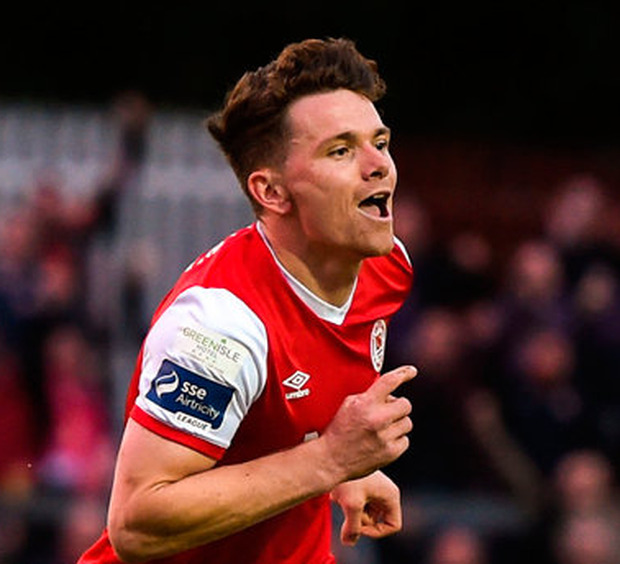 Cork City scored a late equaliser to earn a point against St Patrick's Athletic at Turner's Cross last night but the dropped points could prove a fatal blow to their hopes of retaining the Premier Division title. Sub Josh O'Hanlon headed in fellow sub Gearóid Morrissey's cross in the 83rd minute after Dean Clarke had put Pat's ahead 11 minutes into the second half. However, the Rebel Army - lethargic overall in the wake of their midweek European exit against Rosenborg - now sit level on points with Dundalk but with two more games played. The opening half-hour had little in the way of goalmouth action, a low Clarke shot wide the only real activity of note. On 33 minutes, Clarke was tackled by Steven Beattie in the penalty area and, after City failed to clear, the subsequent attack saw Clarke's shot parried by Mark McNulty and Ryan Brennan could only send the rebound over the bar. Soon after, Kevin Toner headed over from a Campion flick, while Campion nearly got on the end of Conor Clifford's delivery but controlled the ball with his hand. The sides went in scoreless at the half-time break and City had more endeavour on the resumption, with Ian Bermingham having to do well to stop Karl Sheppard reaching a Cummins knock-on and Shane Griffin's cross from the left almost dropped in at the far post. However, Pat's struck after that as City were caught napping from Byrne's free kick and Clarke profited from Campion helping the ball in. Jamie Lennon might have made it 2-0 but Conor McCormack got a good block in. Then McNulty had to save well from Byrne's header when Clarke found him with a well-placed cross. McNulty saved his first effort following an Achille Campion flick-on from Conan Byrne's quick free kick. City brought on Gearóid Morrissey and Josh O'Hanlon as they went 4-4-2 and the latter headed wide from a Shane Griffin cross on 80. Liam Buckley's side remained dangerous on the break and another former City man in the Saints' ranks, substitute Ian Turner, was unlucky when Bermingham's cross rebounded off him rather than falling nicely to his feet. Turner was then almost in from Simon Madden's pass but McNulty was alert to the danger and cleared. When John Dunleavy - on for the injured Steven Beattie - found Morrissey, he carried the ball forward and his cross was met by O'Hanlon at the near post. The home support of 3,296 sensed an unlikely winner but despite seven minutes of normal time and five more added on, another goal remained elusive. The closest they came was when Morrissey fired over after a Sadlier cross was punched clear by Brendan Clarke. They will now be hoping that Sligo Rovers can do them a good turn by taking points off Dundalk tonight at the Showgrounds.